Elastic Skin Joe (??? 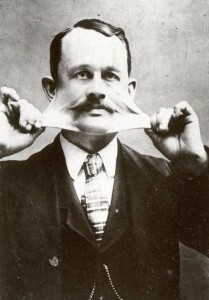 – January 2, 1926), whose real name was Clarence H. Alexander, had Ehlers-Danlos Syndrome, a condition that gave him elastic skin. Clarence was a man who bounced like a ball. He had the ability to stretch his skin as much as eighteen inches from his body, with no perceivable pain. He could also pull the skin of his neck over his head, which was reported to resemble an elephant’s trunk. Elastic Skin Joe had a huge tongue that he could use to lick his forehead. Clarence supposedly killed himself in front of an audience because he didn’t win the affections of the show’s Tattooed Woman.